Vin Scully – the only Dodger I don’t hate. I hate the Dodgers (with the exception of Vin Scully) with a passion. Early in the season, when the Dodgers were sinking in the NL West and hefting a massive payroll, I was happy to enjoy their misery. However, since June 22, the Dodgers are an MLB-best 37-8. That’s an incredible record, and has pushed the Dodgers to a 7.5 game lead in the NL West. Rookie Yasiel Puig has been a big reason for the resurgence. With about 1/4 of the season remaining, some of the races are losing suspense. Atlanta has a massive 14.5 game lead in the NL East. To put this in perspective, if the Nationals were to go 37-8 down the stretch (matching the Dodgers’ incredible run), they’d end up at 94-68. The Braves would need to merely go 22-22 down the stretch to tie for the division title. I’ll go out on a limb and hand the division title to the Braves. Jim Leyland managed the 1992 Pirates – the last Pittsburgh team to have a winning record. The Pirates – who have not had a winning record since 1992 – are in a fairly tight division race, with a 3 game lead over the St. Louis Cardinals. They are a virtual lock to finish above .500 this year, though. They’d need to merely go 12-33 to finish at 82-80. A playoff spot is nearly as safe. They have a 10.5 game lead over the odd man out in the NL Wild Card race, the Arizona Diamondbacks. If the Pirates can keep their heads on straight and just play one game at a time, they should be in good shape. If my Rockies can’t win the World Series this year (and this seems like a long shot), then I’ll pull for the Pirates. The Kansas City Royals have also been playing well lately. Although many fans criticized the Wil Myers for James Shield trade in the off-season, it’s hard to fault the performance of Shields this year. Shields doesn’t have a lot of wins this year (his record is 7-8), but he has pitched extremely well. As the team improves around him, Shields’ numbers should only improve. First baseman Eric Hosmer’s power stroke has been missing, but he’s hitting .297 with a .782 OPS. If he can regain the power, he should be an offensive force. Third baseman Mike Moustakas is probably the key to the future. If he figures things out, this team could go far. Last week, Mike Trout became the first player in MLB history homer on his 21st and 22nd birthdays. The major leagues date back to 1876. Of course, this is an impossible feat for half the players – the ones born during baseball’s offseason. Cool historical footnotes aside, Trout is having another incredible year. He’s hitting .330 with 20 homers – and is leading the American League in walks, with 71. Young hitters don’t often have the patience or command of the strike zone to lead the league in walks. Trouts walks actually allow him to maintain a high batting average, because he’s swinging at fewer balls (this generally results in weakly hit balls). How historically good is Trout? A career WAR (wins above replacement) of 60 is the general guideline for a Hall of Famer. After just 294 games in the majors, Trout is already at 18 WAR. Remember when Bryce Harper was the hot prospect? He hasn’t been keeping up the incredible pace of Trout (who just turned 22), and has also been getting overshadowed by Yasiel Puig (turns 23 in December). Harper’s actually be doing pretty well, though. He has 17 homers in just 331 at bats (he missed some time due to injury), and despite a somewhat pedestrian .262 batting average, Harper has a .866 OPS. Those are good numbers regardless of age, but for a guy who doesn’t turn 21 until October, they are downright fantastic. Trout has set expectations sky high for 20 year olds, but the reality is that the vast majority of 20 year old players are still a few years aware from the major leagues. While it’s likely that Trout will remain the better all-around player, don’t be surprised if Harper contends for a home run title in the next few years. 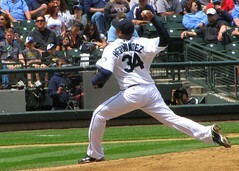 How underrated is Felix Hernandez? Felix Hernandez has been around forever – but he’s just 27. People who track velocity say that he has lost a couple MPH off his fastball. Despit this, his strikeout rate continues to increase, and is at a career high this year – while his walk rate is at the lowest of his career. The only thing keeping Felix from racking up multiple Cy Young awards is his team. Over the course of his career, Hernandez is 103-25 when the Mariners score at least 2 runs for him. His record for all games? 110-81. In addition to the 7-56 record when the team scores zero or one runs, there are also a lot of no-decisions for Felix. If Hernandez was on the Yankees, he might have 160 or more career wins by now. Barring injury, Hernandez still has a really good shot at the Hall of Fame. 240-250 wins would probably be enough, and at age 27, he still has plenty of time. However, I think a lot of people may be underestimating just how good Hernandez is. We could be witnessing one of the all time best pitching careers and might not even realize it. All Star Game Reactions Why Does DiMaggio’s Family Want Hannah’s DNA?